The European Union’s chief Brexit negotiator has revealed the EU is “ready to improve” its Irish border proposal – in an apparent climb down from Brussels’ previous hardline stance on the issue. Speaking following the General Affairs Council on Article 50, the French negotiator claimed October will be the “moment of truth” for Brexit negotiations adding: “We are now on the home straight”. Mr Barnier insisted that there would be no hard border in Ireland, claiming that any future deal will see a “set of technical checks and controls”. “We are ready to improve this proposal. Work on the EU’s side is ongoing. We are clarifying which goods are arriving in Northern Ireland from the rest of the UK would need to be checked and where, when and by whom these checks could be performed. Michel Barnier later added: “We are working to improve our proposal. You have got to remember that the problem in Ireland, in the light of the long and positive history of the Good Friday Agreement, and the cooperation of both sides and the Common Travel Area. “The problem is created here in particular for goods, by Brexit. I note Theresa May’s commitment last December as she confirmed in March to find a solution. Mr Barnier also claimed that October was a “moment of truth” in Brexit negotiations. The Irish border issue has been a major sticking point in Brexit negotiations, with both sides insisting there will be no return of a hard-border. 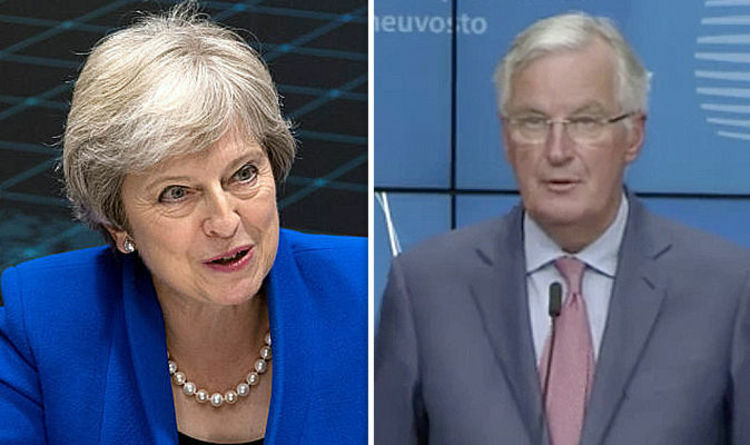 Mr Barnier speech comes ahead of Wednesday’s informal gathering in Salzburg where Theresa May will attempt to make a direct pitch to fellow leaders to back her Chequers deal. Brexit Secretary Dominic Raab said it was time for the compromises made by the UK to be “matched on the EU side”.